Three-month-old Perri gets her first bath at the SEGA adoption kennel in Georgia. It is spring, (finally). I have just washed and aired out all the winter bedding. My windows sparkle, my floor have been de-beached from all winter sand. The entire house is filled with the breezy scent of spring cleaning. Even the litterbox smells great! Suddenly, my poor winter taxed olfactory senses go into “High Alert”. Something smells! I search high and low until I come upon the culprit. It “tis” the dogs. They smell doggy, musty. This cannot be. Lovingly brushing them at least 2x per week, cleaning their ears and even brushing their teeth on occasion. These dogs stink. “Well”, I cry. “In the spirit of Spring cleaning, I shalt wash the mutts”. Not being a professional groomer I whip out my trusty Dog Owner’s Home Veterinary Guide to review the section on bathing. “Smooth coated breeds, such as the beagle and dobermans, should be bathed only when necessary”. “My greyhounds, they stink. Therefore it is necessary. Where?? My strong suggestion is to use your bathtub. You can put down a towel on the tub floor to give your greyhound traction. To get your beast into the tub gently lift his front half in first and then the rear. If you choose to bathe your dog outside please don’t use COLD water from the hose. If it gives you the willies think what it does to your thin skinned greyhound. What should I bathe him with? Use a good commercial dog shampoo. Most human shampoos are on the acid side. If there is a flea and tick problem, I recommend using “Mycodex with Pyrethrins.” There are even shampoos specially formulated for your dog’s color. 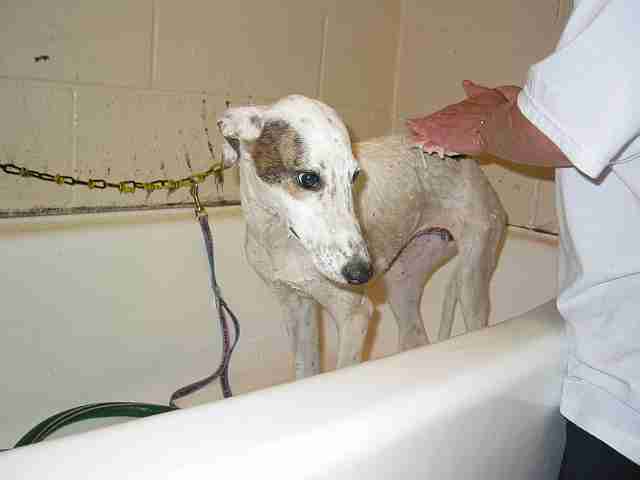 Webmistress’s note: Brush your hound before you wash your hound and/or put him in a tub. You’ll be amazed at how much hair you’ll keep out of the water and your drain. Plug his ears with cotton and instill ointment into the eyes to prevent soap burn. A drop of mineral oil is an excellent idea. I don’t usually go this route unless I am using a flea and tick shampoo. In order for the shampoo to really do it’s job you have to do the head and neck area thoroughly otherwise the little monsters will hang out there until the bath is over. If I am bathing purely for olfactory peace of mind I will usually do only up to the neck area. Then after the bath is over I will use a warm wash cloth to gently wash the dog’s face free of food crud etc. Wet your dog thoroughly, using a nozzle and spray. Make sure the water is warm and not too hot or cold. A handy technique if you have don’t have a nozzle (and don’t mind taking a shower too), use the shower fixture. Then add soap (a little goes a long way), and lather. If you are using a flea and tick product you might have to work up a lather and let it stand for 5 minutes. Rinse thoroughly. re-lather and re-rinse legs, feet and areas that might have stubborn stains. Make sure you rinse that dog well! Soap left can dull the coat and irritate the skin. Gently lift your dog out of the tub. Make sure you have at least 2 BIG towels ready. Place them over the dog quickly. But don’t scare the living daylights out of him or her. If you can get the towels on fast enough. You can stop an unmitigated disaster known as “The After Bath Shake Syndrome”. The dog wrings himself off and deposits water in every corner of the bathroom if you don’t. Dry your dog gently with towels. Your dog’s coat will remain damp for several hours so keep him indoors and out of drafts. Now my mutts are washed. Sultan is sleeping on the bed, damp with a towel over him. Tauri on the other hand is doing a “happy”, “happy”, “joy” dance all over the house, jumping on the couch, rubbing his head on the pillows. shivering, shuttering, jumping up on the bed, and digging holes in the bed clothes. He is ZESTFULLY clean. He should be in commercials. I proceed to clean up the bathroom, and the kitchen and the living room and the bedroom again. So much for spring cleaning. But, “by God” my nose is happy again. Then something else dawns on me. As the days are lengthening and the dogs are exposed to more daylight, it is time for the “Spring Shed”. AACCKK!